Shahnaz Husain is the pioneer of organic beauty care in India and has achieved unprecedented international acclaim for her practical application of Ayurveda, the ancient Indian system of herbal healing. Her deep study of Ayurveda, the Indian holistic system of herbal healing could offer the ideal answers to protective, preventive and even corrective cosmetic care. Today, she heads the largest organization of its kind in the world, with a chain of over 400 franchises worldwide, as well as Ayurvedic formulations for skin, hair, body and health care. Currently, the Shahnaz Husain Group operates in more than 100 countries worldwide. She trained for ten years in cosmetic therapy and cosmetology, at Helena Rubinstein, Swarzkopf, Christine Valmy, Lancome and Lean of Copenhagen, adopting the principle of "Care and Cure". She has evolved nearly 375 formulations for general beauty care, treatment of skin and scalp disorders, health and fitness. She has recently launched some revolutionary products, which include the 24 Carat Gold Range, Pearl Cream and Mask, Oxygen Cream, Diamond Collection, Plant Stem Cells, the Platinum Range, the revolutionary Telomere DNA Defence and Black Diamond ranges. Her contribution towards woman empowerment is noteworthy. She encourages ordinary housewives to open salons in their own homes, training them in beauty and health care. She has also written a beauty book, which has been put in Braille. She has received several prestigious international Awards including the “Outstanding Ayurvedic Innovation Award” at the House of Commons, the “Woman of the Year” Asian Achievers Award as well as the prestigious Olympia Award for “Outstanding Contribution in Ayurveda and Plant Cosmetics” at the Olympia Show in London. She became the first woman to receive the World's Greatest Woman Entrepreneur Award from Success magazine. Her other international Awards include the Arch of Europe International Gold Star in Madrid, the Quality Excellence Award in Geneva, Cannes and London, Golden America Award in New York, the Outstanding Woman Entrepreneur Award in London, Woman of the Millenium Award in USA, and the WQC International Star Award in Paris and Leonardo da Vinci Diamond Award by International Biographical Centre, Cambridge. She was also honoured with the prestigious “Most Admired Beauty Personality – Retail Category Award” from the Images Group, as well as the “Asia's Leading Woman in Business”Award from WIL Forum Asia, in Malaysia, and the Outstanding Ayurvedic Innovation Award from the China Chamber of Commerce. She was honoured with the Padma Shree Award by the Government of India. 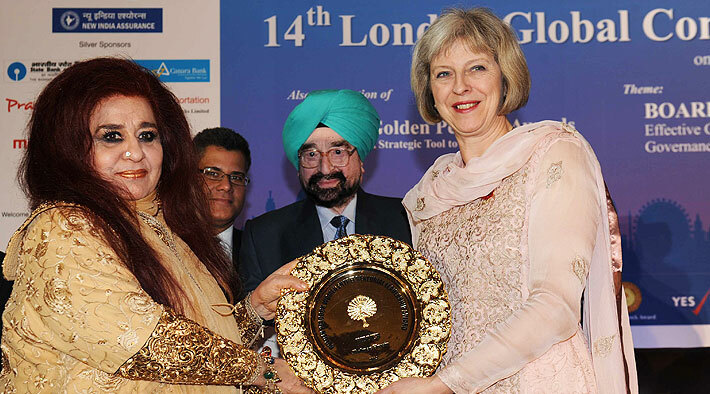 Recently, she achieved the dual honour of speaking at the House of Lords and House of Commons. One of her highest achievements was to be invited to the U.S. President Obama's Summit of Entrepreneurs in Washington in 2010.